Custom GFRC door and door surround by Stromberg’s. Beautiful, timeless and quality lasting doors and door surrounds are a unique and exquisite way to add style and practicality to your home, church, university or place of business. Stromberg Architectural offers door and door surroundings that are composed of quality GFRC materials that will stand up to the outdoor elements. Glass Fiber Reinforced Concrete (GFRC) is a concrete composite that uses glass fibers for reinforcement instead of steel. This works especially well for doors and other outdoor applications, since the glass fibers won’t rust like steel fibers. Since there are no steel fibers to protect from rust, there is no need for protective concrete cover allowing GFRC structures to weigh a fraction of traditional precast concrete. It’s light, practical and durable. Stromberg Architectural has taken the practicality of GFRC and coupled it with our unique methods of detailing, manufacturing and installing that have made Stromberg Architectural the world leader in GFRC design and installation. In fact, our designers and architects have more than 30 years of experience and completed over 1400 projects. 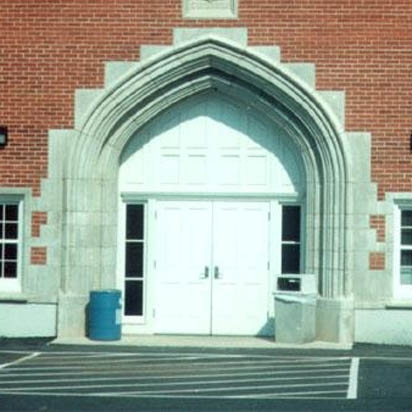 Stromberg Architectural specializes in door and door surround designs and restoration. For many of our clients, matching the materials currently used on their buildings and homes can pose a challenge, but Stromberg has developed a system that allows the GFRC material to emulate nearly any building material. We can patch existing surroundings or create new surroundings that are exact replicas of originals. Additionally, Stromberg GFRC works with stone, metal, concrete or even wood. This allows clients to maintain the look of the surrounding building. For many of our clients we are able to preserve the historical integrity of the building’s original doors and door surroundings. Brand new doors and door surrounds in GRFC are a great way to add long lasting beauty to your building. At Stromberg’s, we have a large variety of GFRC door design to choose from, or we can custom design the perfect door or door surround that meets your specific needs. Quality GFRC is a prime choice for door surround installation and restoration because of the materials incredible resiliency to the outdoor elements like wind, hail, rain and snow. Unlike concrete or stone, GFRC is completely resistant to erosion and won’t crack when exposed to extreme temperature variations. It doesn’t rot or delaminate over time, and it won’t rust or corrode like metal. Your GFRC door surrounds from Stromberg Architectural will remain beautiful for generations to come. Not only are our materials the strongest, most practical and durable, but our team of designers and artisan will work one-on-one with you to create doors and door surrounds that are custom to your resident or business. Our team will work closely with you to make sure everything matches your exact specifications. GFRC is strong, durable and stands up to outdoor elements like wind, rain, snow and extreme temperatures. Stromberg GFRC materials can match any architectural style and design. Made to emulate any building material including stone and wood. Stromberg GFRC is incredibly lightweight making installation less timely and cost efficient. Stromberg’s is here to help with CAD details, design assistance and specifications. Contact them today at (903)454-0904 for a free custom quote, and put their 30 years of experience to work for you.